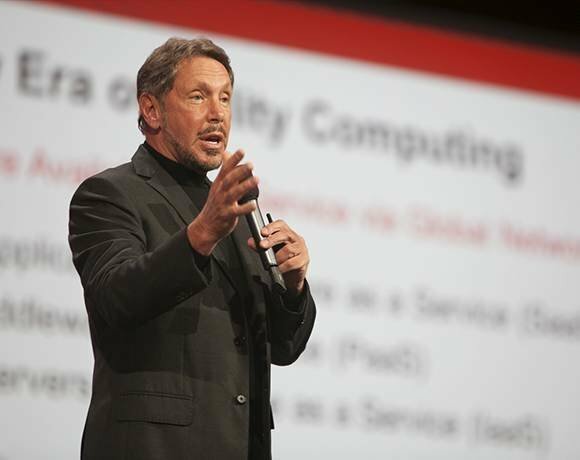 Oracle’s fourth-quarter 2014 results show 25% growth in cloud revenues to $322m and total annual revenue of $38.3bn, up 3% year-on-year. The supplier reported its cloud revenue separately for the first time. It represents 3% of sales. For the quarter, software and cloud revenues were up 4% to $8.9bn. GAAP (generally accepted accounting principles) cloud SaaS and PaaS revenues were up 25% to $322m, while non-GAAP SaaS and PaaS revenues were up 23% to $327m. Cloud IaaS revenues were up 13% to $128m. New software licence revenues were unchanged at $3.8bn, while software licence updates and product support revenues were up 7% to $4.7bn. Hardware systems revenues were up 2% to $1.5bn with hardware systems products up 2% to $870m and hardware systems support up 2% to $596m. However, GAAP net income was down 4% to $3.6bn, and GAAP operating profit was down 2% to $4.9bn. For the entire 2014 fiscal year, total revenues were up 3% at $38.3bn, while GAAP software and cloud revenues were up 5%. Cloud SaaS and PaaS revenues were up 23% to $1.1bn while cloud IaaS revenues were up $456m. For the year, new software licence revenues were unchanged at $9.4bn, while software licence updates and product support revenues were up 6% to $18.2bn. Total hardware system revenues were flat at $5.4bn. GAAP operating income was up 1% to $14.8bn, and GAAP operating margin was 39%.